Meghan McCain wants Americans to know she hates what President Donald Trump has done to the Republican Party. The 34-year-old co-host of The View went on a tirade saying, “I’m John McCain daughter,” and she qualified that by adding that she’s against the wall. McCain tried to explain she is for ” beefing up border security,” but she is 100% against Trump’s plans for a wall. Well, she was just made to regret her words. You’ll love this. Meghan McCain has made it quite clear she hates President Trump. The former Fox News contributor claims Trump hijacked the Republican Party. “Ever since Donald Trump asserted himself on the main stage of Republican Party politics, I have woken up each morning dreading the polarizing, ugly, race-baiting, or sexist remarks he would make. I’ve watched political battles get more and more heated in terms of rhetoric,” said McCain. 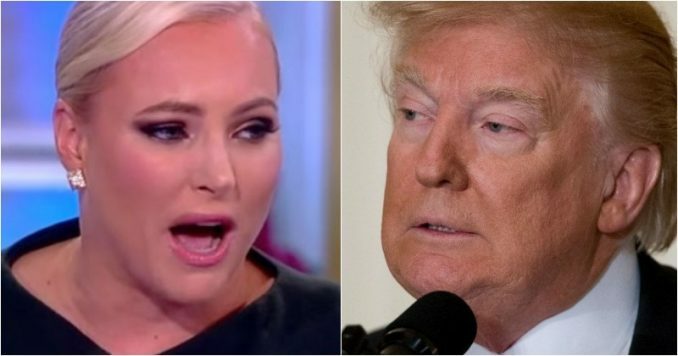 Ever since Meghan McCain left Fox News, she has been trashing the president, and no one can forget the lengths the McCain family went to bash Trump at John McCain’s funeral. “Donald Trump has hijacked my party and turned it into something dark that I do not recognize,” charged Meghan McCain. Meghan sees herself as a “real Republican” and views those who support Trump as not smart enough to grasp what “real Republicans” stand for. “Donald Trump is the most divisive political figure of my lifetime, and his rhetoric is not only dangerous, but it threatens the very fabric that makes us Americans,” claimed the 34-year-old daughter of John McCain. That caused Meghan McCain to make sure Americans knew how she felt about the president and the wall. “I think I have made myself quite clear about how I feel about President Trump, about the America that was always great until he came to it. I think I have made myself explicitly clear on this show and other places! So please don’t paint me, just because I am for border security, that I am somehow a racist, that’s not fair. I’m against the wall, let that be said,” exclaimed McCain. Meghan did make it clear that those Never-Trumpers who are for “strong border security” aren’t racist. And, in her defense, she did add that not everyone who supports the wall is racist. But, it’s her daily assault on the president and refusal to give Trump credit where credit is due that makes her act on The View so disingenuous. Then, Joy Behar insinuated that the Republican platform was racist. “All I’m saying is check the platform, not the person,” quipped big mouth Behar. McCain banged the table and yelled, “I am John McCain’s daughter. I am not someone who sits here and is OK with racism.” Well, Americans weren’t on board with Meghan McCain’s Never-Trumper tirade. Maybe Meghan McCain conveniently forgot her father was for completing the “danged fence.” And, maybe she fails to realize that John McCain also sounds a lot like the man she calls a disaster for America: President Trump. McCain admitted that drugs, human smuggling, home invasions, and murder happen all because we do not have an adequate wall on the Southern border. President Trump hasn’t hijacked the Republican Party. He is doing the hard thing those like John McCain couldn’t do. He is willing to jeopardize his political standing to shut down the government to make sure we have a wall. He’s not doing it for his ego. He’s doing it because he knows that’s what we elected him to do. In years to come, those like Meghan McCain will rue the day they ever trashed President Trump.